There are strong indications in Abuja that the Department of State Services will soon apply for a court order to freeze the bank accounts of a former National Security Adviser, Col. Sambo Dasuki (retd.). The PUNCH learnt on Sunday that Dasuki’s bank accounts would be frozen because of the investigation into the spending of the funds appropriated for defence. The sum of N28.5bn was earmarked in the 2014 budget for the purchase of security equipment by the office of the NSA. The DSS is planning to apply for court order to freeze Dasuki’s accounts in order to prevent the funds in the accounts from being depleted. The accounts, fit was learnt, would enable investigators to track the inflow and outflow of money from them as well as the sources of the money. The DSS had invaded the ex-NSA’s house on Friday. The PUNCH reliably learnt that the former NSA would be invited for further questioning over items found in his house as well as the spending of anti-insurgency funds. The DSS had on Friday surrounded the house of Dasuki in Abuja and forced the former NSA to stay indoors for about 24 hours. The operatives were said to have seized the international passport of the former national security adviser. The security agency had in a statement on Saturday night accused Dasuki of felony, misuse of power and possession of destructive weapons. 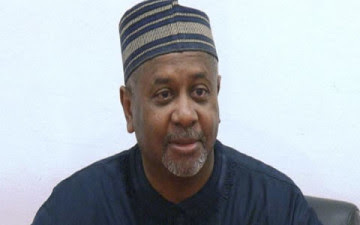 It said it recovered from Dasuki’s home seven high calibre rifles (high assault weapons), several magazines, military related gears and 12 new vehicles, including five bulletproof cars. “We will apply for a court order and the bank accounts of the former NSA would be frozen this week when the investigation starts. The present administration believes in accountability and will investigate how defence votes were spent,” the official said. A Lagos lawyer, Mr. Festus Keyamo, said the bank account of any citizen could not be lawfully frozen without first obtaining a court order. “You cannot freeze the account of anybody without a court order. It cannot be done by executive fiat,” the lawyer told one of our correspondents on the telephone on Sunday. It was learnt that the former NSA might be charged with treason and corruption, if found culpable. But a lawyer, Yunus Abdulsalam, dismissed the threat to charge the former NSA with treason based on the items recovered from his home. Though, he admitted that the search conducted by the DSS at the former NSA’s home was valid since it was backed by a court order, he however contended that all the items recovered from Dasuki constituted property that could be legitimately owned by any citizen. Abdulsalam said, “Once there is a search warrant and the search is conducted, it is valid; there is no doubt about that. “Under section 36 of the Constitution, it is presumed that everybody has the right to own property and the presumption of the law is that you are the owner of the property. Also, an aide to the former NSA, who spoke on the condition of anonymity, described the allegations against his principal as laughable. The aide said that the cars that were removed from Dasuki’s Abuja house belonged to his family members and friends. He also explained that the guns found at the residence of the former NSA were for his security team and not for any intent against the state. The source said that Dasuki had been outside the country doing international business for years and that he was a rich man before his appointment. The source added that the former NSA, a son of a deposed Sultan of Sokoto, resigned from the Minting and Printing company as the managing director on his own and that he could not have stolen a bulletproof car when he had enough money to buy on his own. The aide further argued that there was nothing stopping the ex-President Goodluck Jonathan’s NSA from venturing into his personal business after serving the state if he wanted to. He said, “What I can tell you is that the allegations are laughable. What is he going to do with bulletproof cars in this era of technology? “The person we are talking about was a former ADC to a former President, a former Managing Director of Minting and Printing, who has been outside the country doing his international business.